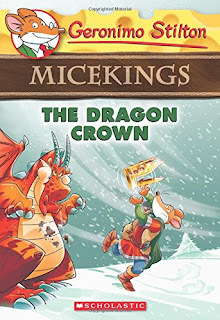 In this chapter book, once again Geronimo Stilton and his mouse friends and family must be brave as they help each other during their adventures. The authors have taken care to make sure the reader is introduced to the characters with detailed descriptions. I enjoyed reading this early part of the book and it made it easier to understand the characters as I read each chapter. There is humor and interesting ways that the text has fun with the words and color coding important words for the reader. There is adventure as Geronimo is captured by two dragons. Thea and Trap set him free , but then Trap is captured. So again, there are plans to be made to help Trap escape. The story is fast paced and the reader will enjoy each chapter and of course the happy conclusion to the story. Your second through fourth grader will enjoy this fast action story.